Home security should never be taken lightly, but many homeowners neglect to take some of the most inexpensive measures to protect their property. In today’s post, we’ll explain five easy ways that you can improve your home security. Tech Xpress supplies surveillance camera systems in Bakersfield, and we would love to help you keep your home safe. Get in touch with us today to get started! Thieves look for easy targets. Whether it’s spotting a new piece of artwork through the window or noticing that you left your new flatscreen’s box by the curb, you should always avoid advertising that you have valuable items in your home. Close your curtains and check that you’ve locked your home up each night as an added precaution. If you have an expensive car, then resist the temptation to keep it parked in plain sight It sounds simple, but taking a few minutes to double-check your locks, close your curtains, and park your car in the garage could save you thousands. Surveillance camera systems are one of the best ways to keep your home safe around the clock. They can provide the authorities with valuable information in the event that someone does break into your home, and they can also function as an always-on-duty deterrent that will make would-be intruders think twice about entering your home. Tech Xpress offers security camera installations that can help you deter crime and protect your home, so get in touch with us and let us help you keep your home safe! Whether you’re going away for a few days or a few weeks, it’s always a good idea to let your neighbors know that you’ll be gone. They can periodically check in to make sure that your surveillance camera system is working properly, and they can also turn your lights on and off to make it look like you’re still at home. Additionally, ask your neighbor if they would be willing to pick up your paper and collect your mail, as these are often clear indications that you’re away. 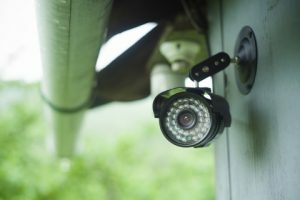 Much like security camera systems, motion-activated lights can reliably deter would-be intruders without any effort on your part. Although it’s easy to tell if lights have been triggered automatically, motion-activated lights are a way to let thieves know that you take security seriously. Many homeowners hide at least one key just in case they get locked out. Maybe it’s under the front mat, or perhaps it’s under a fake rock near the side of the home. Spare keys are one of the first things thieves look for, so either give your spare key to a trusted neighbor, or invest in a keyless entry system if getting locked out of your home is a serious concern for you. We hope that today’s entry will help you keep your home safe. Contact Tech Xpress to learn more about our affordable security camera installations in Bakersfield! ©2018 TechXpress® - Do not copy. All rights reserved.